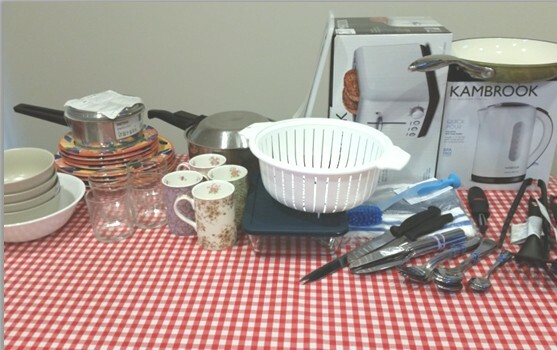 This exciting new project by Janice Challinor, Diane Hutchinson and Jan Macindoe from the Community Development Subcommittee will provide essential cooking and eating equipment for those who move from Glebe’s supported accommodation facilities into independent accommodation. Initially the project focuses on families who move from Elsie Women’s Refuge – a centre which provides crisis accommodation and case management for women with accompanying children, who have experienced domestic/family violence. This project is supported by Harvey Norman Broadway and the Community Op Shop in Glebe St. We also hope to have the support of the City of Sydney, through our grant application. But we most especially need the support of Glebe Society members. The items in our Kitchen Starter Packs will primarily be pre-loved, so this project provides an opportunity for Glebe Society members to recycle surplus kitchen equipment. It also allows us to meet an important need in our community. Families moving from supported accommodation to their own home receive some assistance in sourcing major items such as refrigerators and furniture, but basic kitchen equipment is more problematic. 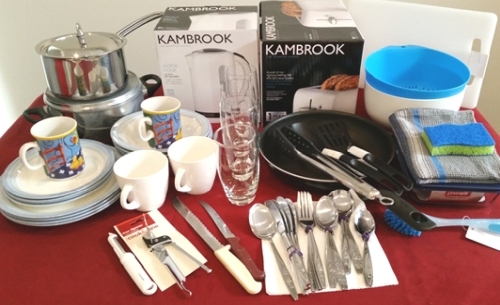 Glebe has only two op shops and good quality kitchen essentials are snapped up quickly. Our Kitchen Starter Packs address this gap, providing families with enough equipment to start preparing meals as soon as they move into their new home. Feedback from our pilot study and from Elsie staff have emphasised how important this is for recipients. There will be a packing slip attached to the outside of the box, so the recipient knows exactly what they will find when they move into their new home. To cater for different family types and cooking styles, we will also provide recycled optional essentials in an open box which Elsie residents can access when they are about to move. Optional essentials include things like unbreakable tumblers and plates needed by families with very young children, and cooking tools and equipment with specific uses, such as potato mashers or baking dishes. You can contribute by providing recycled items on the core or optional lists below. These might be your own surplus, or you might canvass friends and neighbours who are moving, downsizing or simply having a clean-out. To provide any of these goods, you can either email Diane (vice-president@glebesociety.org.au) to arrange pick-up (if possible, suggest two pick-up times that would work for you), OR bring your recycled goods to the Meeting Room at St Helens Community Centre, on Wednesday 21 March 3-6pm (subsequent times TBA). Please do not leave any goods at St Helens outside our advertised times – there will be no-one able to take them, so it would be treated as illegal dumping. Initially, the only equipment most families will have in their kitchen cupboards will be the contents of their Pack and things they have selected from the Optional box. Any cooking equipment with multiple uses will be especially valuable. For example: an ovenproof bowl that can also be used as a mixing bowl and a salad bowl or a deeper frypan that can also be used for making stir-fries or sauces. We need to ensure food safety so all recycled goods must be washed at high temperature prior to packing. No timber or soft plastic, no cracked or chipped crockery and no scratched or abraded coating on non-stick cookware. If we end up with any surplus items, we will take them to the Community Op Shop unless you indicate, by marking your name on the goods, that you would like them returned to you. cheque made payable to ‘The Glebe Society Inc’, sent to The Treasurer, Glebe Society, Inc, P.O. Box 100, Glebe, 2037. Please include a note saying that the cheque is for Kitchen Starter Packs. If you have any questions or feedback on the project please email us all by selecting Community Development under the ‘contact’ tab on our web-site, or email Diane, on vice-president@glebesociety.org.au. The Kitchen Starter Pack project grew from the Exchange Platform that Janice Challinor investigated in June-July 2017. The Kitchen Starter Packs provide a narrower range of recycled goods than was envisaged for the Exchange Platform, and they are designed to meet a more specific need. The Community Development Sub-Committee first proposed a pilot of two Kitchen Starter Packs in August 2017. The Glebe Society Management Committee agreed to participate in this pilot. Committee members donated new and recycled goods to supply all the items on our provisional list of ‘essentials’. The two pilot Packs were delivered to Elsie, along with a feedback sheet, at the end of September 2017. Feedback from pilot Pack recipients and our experience with the pilot were used to fine-tune the project and to inform our grant application to the City of Sydney in November 2017. The grant application is to help fund the purchase of the new electrical goods and any other items for which we face a recycling shortfall. It also includes an application for a rental subsidy for a 3 hours slot at St Helen’s community centre twice per month, to provide a convenient recycled goods drop-off point for members. We will be advised of the outcome of our application towards the end of March. The most challenging project design issue was the list of ‘essentials’ included in the Packs. Different families have different equipment needs depending on the age of their children and the family’s eating and cooking preferences. We can’t cater for all possibilities because we need to limit the volume and weight of the Packs to ensure the project is manageable. We resolved this issue by dividing our list of essential items into ‘core’ (included in all Packs) and ‘optional’ (to cater for individual needs and accessed through an open box held at Elsie). We approached Elsie management, who agreed to hold the ‘optional’ box which we will re-fill when and as we can. In early February 2018, with two families about to move out of Elsie, we delivered an ‘optional’ box and two Kitchen Starter Packs (primarily using goods Committee members sourced from friends). We will keep an eye on the ‘optional’ box to gauge how well this system is working and to identify what type of items are being accessed regularly. As all women at Elsie have at least one child, our standard Pack will have crockery and cutlery for 4. If there is a larger family, we will make up a custom Pack for 6. In an average year, 11 families move from Elsie to their own home, but they don’t move at regular intervals. To make sure we cater for each move, Elsie will hold a stock of 2 Kitchen Starter Packs as well as the box of optional items. Ideally, we will also hold enough stock to make up at least two more Packs at short notice, and we will post announcements in the Bulletin about any items that are in particularly short supply. Diane Hutchinson will be Project Coordinator for 2018. She will make up the Packs and deliver them to Elsie, along with anything we have for the box of optional items. All cash donations and invoices will be submitted through the Society Treasurer, Jane Gatwood.